A chemical firm has been fined after a hydrogen explosion blew a vessel lid through a factory roof, leaving a worker with minor injuries. Catalloy Ltd. was prosecuted by the Health and Safety Executive (HSE) following the incident at its plant on Moss Bank Road in Widnes on 25 November 2011. The company was fined £80,000 and ordered to pay £80,000 in prosecution costs after pleading guilty to two breaches of the Health and Safety at Work etc. Act 1974 by failing to ensure the safety of workers. Warrington Crown Court heard on Thursday 24 September, that the company, which produces metal catalysts used by the pharmaceutical and petrochemical industries, had made a modification to one of its reactors. 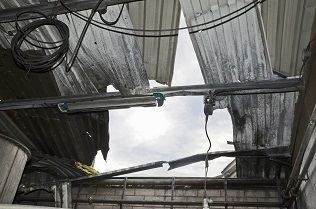 The explosion occurred on the first day of production following the modification and blew the lid and other equipment through the corrugated panels on the roof of the factory and into a neighbouring car park. A worker also suffered cuts to his hand and back. The HSE investigation found the firm had fitted a new seal on the reactor to prevent air getting in, but had not properly considered the risks of the increased pressure inside the equipment during the production process.